OK - so you want to wear fur boots, but don't want to harm animals in the process? These vegan fur boots are for you! We've found 7 pairs of boots that look like the real thing, well without being real. 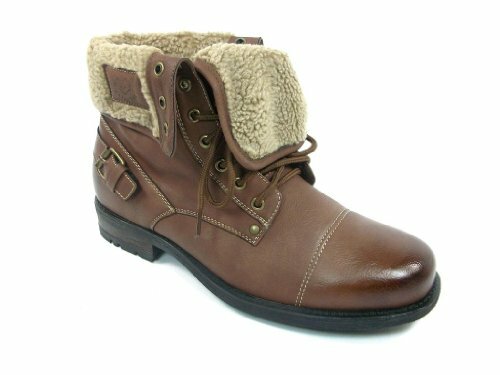 Women's winter wonderland mid-calf snow boot in dark brown vegan leatherette. 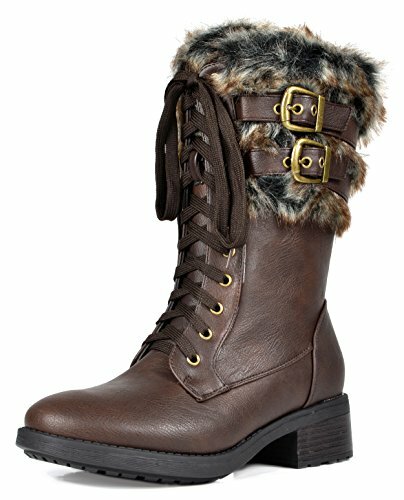 Features brown and gray faux fur lining and cuff that reaches halfway down the boot. Fastens at the top with two gold buckled straps that wrap around the fur cuff. Laces up in the front and zips up on the inner side of the boot. Has a 1.5" synthetic block heel made of rubber for traction on the snow. Advertised as vegan: No, but the materials listed are leatherette, faux fur and rubber. Pros: Fabulous snow boots if you're searching for something stylish and functional. They're warm, pretty and easy on the wallet. Cons: The jury's still out on whether they're fully waterproofed or just water-resistant. Women's tan vegan suede winter boot with super shaggy white faux fur from the top of the boot (which reaches about mid-calf) to the foot. Has a 1" heel and slip-resistant rubber outsole. Pull-on style with a lightly padded insole. Lining is made of soft vegan fleece. Pros: High fashion style for a fraction of the cost. These are the ultimate legging boots. Cons: Probably not great to wear for trekking through the woods as they'd likely get dirty quickly and lose their fashion-savvy appeal. May be a little roomy inside, too. Men's brown faux leather combat boot with a collar that folds down to show the light faux fur lining. Military-style lace-up front secures the boot in place with a brown bootlace. Has a stylish brassy buckle on the heel. Black rubber sole provides some slip resistance on slick surfaces. Pros: Depending on your preference, these boots can be worn with the collar upright and laced all the way up or folded over. Perfect for dark wash jeans and flannel. Cons: Not constructed for heavy-duty activity. They also run a little narrow. Glamorous women's hiking boot in black suede-like material bedazzled with black rhinestones. Black faux fur collar is plush and covers the ankle for warmth and protection. Laces up in the front with shiny silver boot hooks. Black platform heel is low, thick and well treaded for good grip. Easy-breezy cleaning with a damp cloth. Advertised as vegan: No. The boots are made of textile materials and faux fur. Pros: Fabulous boots if you're on the hunt for a pair of light activity hiking boots that are functional and flashy. Pretty winter fashion that pairs well with maxi dresses and leggings. Cons: May not perform well on rugged hikes. These are probably better walkers than serious hikers. 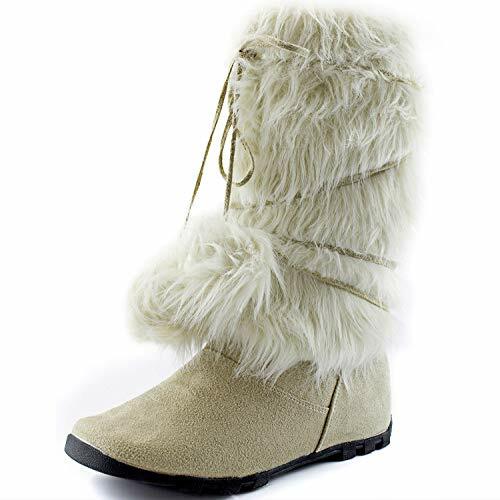 Soft white vegan suede winter mukluk boot for women with white faux fur from the top of the boot to the ankle. Reaches about mid-calf height to keep your legs cozy and warm. 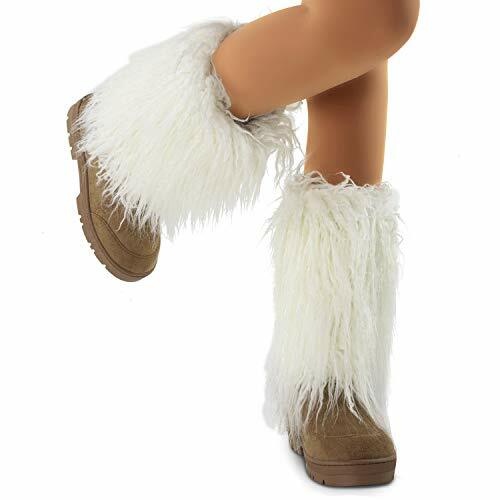 Has sweet faux fur pom poms on the ends of long vegan suede ties you can wrap around the boot a good three to four times. Black rubber lug sole is slip-resistant for snow trudging. Pull-on design makes slipping the boot on and off quick and painless. Advertised as vegan: Yes, in the description — the vendor describes these boots as vegan suede and faux fur. Pros: Very fetching and oh-so affordable winter boots that will keep your feet snug and warm when the weather starts feeling arctic. With the designer look, they'll dress up any pair of jeans or thick fleece leggings. Cons: Not waterproofed, so these boots shouldn't be worn in deep snow unless you waterproof them first. May also require some extra arch support. Men's ankle-high snow boot in black textured material with luxurious brown faux fur lining that peaks out at the top of the boot. Zips halfway down the boot on both sides with inconspicuous black zippers. Non-slip black sole keeps your foot stable on the ground. Has a moc toe and layered fabric detailing on the front of the boot. Pros: Very inexpensive, warm and comfortable boots you can throw on for a casual jaunt in the snow or to walk to work on the slushy sidewalk. Nice enough to be able to keep on all day in the office if you don't feel like changing — they're totally wearable with nice slacks. Cons: The short height limits their usage to lightly snowy conditions as deeper snow would easily come up over the ankle and into the boot. The insole is also a little thin. All in all, these boots are good for general, light wear in the cold months. Women's fashion hiker-style boot in chestnut brown faux suede. Has fuzzy white faux fur around the collar and lining the lace-up front. Brown bootlace is fastened in place with brass boot hooks. Good traction as the 2.5" block heel is made of grippy thermoplastic rubber. Advertised as vegan: No. 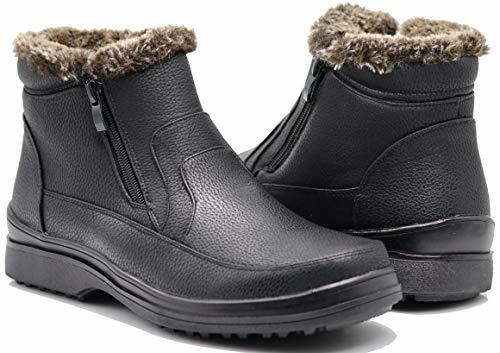 Target's detailing of these boots includes faux fur, polyester, zinc alloy and rubber. Pros: Uber stylish boots to wear with a cute button-down skirt or some trendy high waist corduroy pants. The hiker style lends plenty of comfort so you won't get worn out after a full day of walking in these. Cons: Not actually meant for hiking, though they look durable enough for sustained walking.